Message On Bunker Buster Bomb Tells ISIS "This Is For Making Me Miss Game of Thrones"
Someone was upset they were too busy bombing terrorists in Iraq or Syria to watch the seventh season premiere. An estimated 16 million people tuned in to watch “Dragonstone,” the premiere episode of the seventh season of Game of Thrones. Unfortunately, this apparently wasn’t an option for at least one member of the U.S. Air Force, who, in keeping with the general tone of the show, decided to make their anger at missing the episode the last thing their enemies ever saw. “This is for making me miss Game of Thrones” they wrote on a GBU-31/B Joint Direct Attack Munition (JDAM), according to pictures that appeared on social media. Two other bombs in the pictures appear message-free. Armament technicians can assemble the GPS-guided GBU-31/B with a variety of 2,000-pound class warheads, including the bunker-busting BLU-109/B and the devastating thermobaric BLU-118/B. The Air Force is presently looking to buy new BLU-137/B penetrators to replace the older BLU-109s. You can read all about their various capabilities here. There is nothing in the pictures to confirm where or when the images were taken. However, the three JDAMs are clearly mounted together under the wing of an Air Force B-52H Stratofortress bomber. This is a common loadout for BUFFs flying missions over Iraq and Syria out of Al Udeid Air Base in Qatar. The lumbering bombers touched down in the region to take on ISIS terrorists in April 2016. The brutal extremists have become infamous for gruesome public executions and torture, widespread sexual slavery, draconian dress codes and other social restrictions, and more, all of which would be right at home in George R.R. Martins’ fictional land of Westeros. The group may not have liked some of the more recent episodes, which feature Daenerys Targaryen and her “air force” of nearly unstoppable dragons. Of course, writing slogans, insults, and other messages on bombs, shells, and other military hardware is an old and nearly universal tradition. Taunting one’s opponents before and during battle is probably as old as the notion war itself. Bomb and shell casings do seem to provide a particularly good canvas though, since the writing or pictograms are less likely to interfere with any existing camouflage or other important markings. In addition, when it comes to aircraft, tagging bombs and missiles can be a huge morale boost for ground crews, especially crew chiefs and ordnance technicians, who might not otherwise get to share much esprit de corps with their flying compatriots. By adding their own message to the weapons, these personnel get a direct and visible connection to the mission at hand that anyone and everyone, friend or foe, can see. It’s not the first time we’ve seen this in Iraq or Syria, either. After ISIS members carried out a series of deadly terrorist attacks throughout Paris on November 13th, 2015, pictures appeared online showing GBU-31/Bs, what appeared to be either 500-pound class GBU-38/B JDAMs or similarly sized laser-guided GBU-12/Bs, and Hellfire missiles, all with the “From Paris, With Love” written on them in English in various styles. At the same time, the Russian Air Force got in on the act, inscribing Za Paris – “For Paris” – and Za Nasheeh – “For Our People” – in the Cyrillic alphabet on a number of dumb bombs. Su-24 attack jets reportedly dropped these in “revenge attacks” against ISIS in Syria, though there is no way to confirm that they did end up hitting other rebel groups opposed to the regime of Syrian dictator Bashar Al Assad. Assad and his Kremlin allies have labeled all groups fighting the government in Damascus as terrorists. Less than a month after the Paris attacks, someone at a Russian military exercise thought it would be funny to write World War II-era slogans Za Berlin – “For Berlin” – and Za Stalina – “For Stalin” – on their bombs, sparking a brief spat with Germany. And this sort of messaging hasn’t been limited to the Middle East. 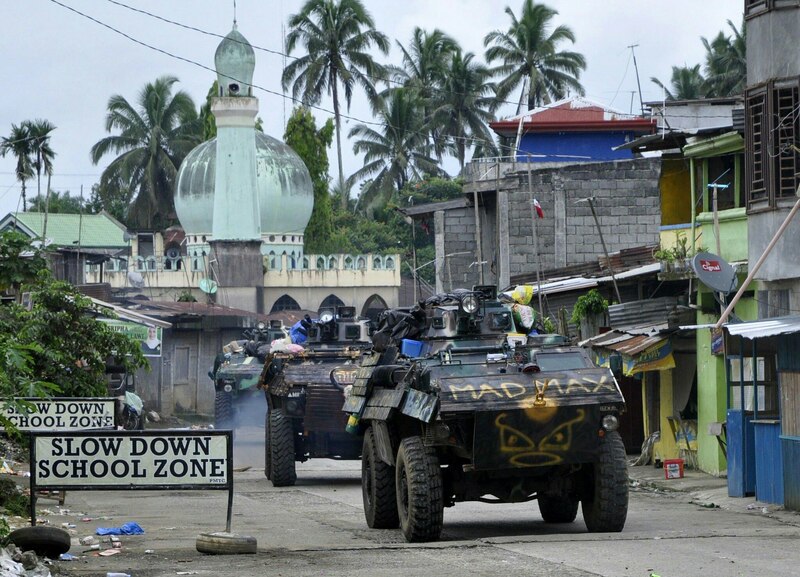 In May 2017, Islamist militants from the Maute group, who pledged fealty to Islamic State, claimed control of the city of Marawi in the southern Philippines. When government security forces moved in to retake the town, they were met with stiff resistance from fighters armed with machine guns and RPGs. In response, many troops added wooden planks to the sides of their wheeled armored vehicles in an apparent attempt to provide some stand-off protection against the shaped charge anti-tank rockets. These quickly turned into signboards, boasting a variety of Tagalog- and English-language slogans ranging from “To Protect and To Secure The Motherland” to “ISIS Hunter” to “Free Wi-Fi.” Another vehicle sported a front panel that said “Mad Max,” a clear reference to post-apocalyptic movie franchise which is heavy on car-based combat. The side of one LAV-300 armored vehicle implored troops to “Make Your Mamas Proud,” along with “DU30,” a slogan that the country’s firebrand President Rodrigo Duterte used during his election campaign. There have no doubt been many more over the years. Feel free to share your own favorites in the comments below. A weapon is scrolled with messages from USAF ground crews before before being assembled for a sortie aboard an A-10 over Afghanistan. The Islamic State's hillside nest was wiped clean.